SMF or MMF, Which to Choose for Date Center Cabling? 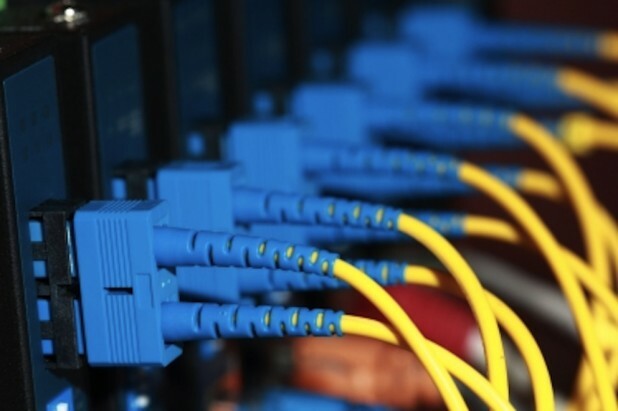 It is critically important to choose the suitable cabling plant for data center connectivity, because the wrong decision may leave a data center incapable of supporting future grown, requiring an extremely costly optical cable plant upgrade to move to higher speeds. In the past, multimode fiber (MMF) has been widely deployed in data center for many years because of the high cost of single mode fiber (SMF). However, the price difference between SMF and MMF has been largely negated as technologies have evolved. With cost no longer the dominant decision criterion, operators can make architectural decisions based on performance. So SMF or MMF, which should be chosen for data center cabling? Keep reading and you’ll find the answer. Many data center operators who deployed MMF OM1/OM2 fiber a few years ago are now realizing that these MMF cannot support higher transmit rates like 40 GbE and 100 GbE. So some MMF users have been forced to add later-generation OM3 and OM4 fiber to support standards-based 40GbE and 100GbE interfaces. But the physical limitations of MMF mean that the distance between connections must decrease when data traffic grows and interconnectivity speeds increase. Deploying more fibers in parallel to support more traffic is the only alternative. So the limitations of MMF have become more serious when it has been widely deployed for generations. The operators must weigh unexpected cabling costs against a network incapable of supporting new devices. Due to the cost of the pluggable optics required, previously organizations were reluctant to implement SMF inside the data center, especially compared to MMF. However, newer silicon technologies and manufacturing innovations are driving down the cost of SMF pluggable optics. Fiber optic transceivers with Fabry-Perot edge emitting lasers (single-mode) are now comparable in price than power dissipation to VCSEL (multimode) transceivers. Moreover, SMF eliminates network bandwidth constraints, where MMF cable plants introduce a capacity-reach tradeoff. This allows operators to take advantage of higher-bit-rate interfaces and wave division multiplexing (WDM) technology to increase by three orders of magnitude the amount of traffic that the fiber plant can support over longer distances. All these factors make SMF a more viable option for high-speed deployment in data center. With 40 GbE and 100 GbE playing roles in some high-bandwidth applications, 10 GbE has become the predominant interconnectivity interface in large data centers. Put it simply, the necessity for fiber cabling supporting higher bit rates over extended distances is here today. With that in mind, the most significant difference between SMF and MMF is that SMF provides a higher spectral efficiency than MMF. It means that SMF supports more traffic over a single fiber using more channels at higher speeds. This is in stark contrast to MMF, where cabling support for higher bit rates is limited by its large core size. As a matter of fact, in most cases, currently deployed MMF cabling is unable to support higher speeds over the same distance as lower-speed signals. The tradeoff between capacity and reach is important as operators consider their cabling options. Network operators need to assess the extend to which they believe their data centers are going to grow. For environments where users, applications, and corresponding workload are all increasing, SMF offers the best future proofing for performance and scalability. And because of fundamental changes in how transceivers are manufactured, those benefits can be attained at prices comparable to SMF’s lower performing alternative. New sophisticated networking services, coupled with the increase of Internet users push the Internet traffic to an even higher point, driving the need for increased bandwidth consequently. One Ethernet technology—10 Gigabit Ethernet (GbE) is adequate for such bandwidth demand, and has become widely available due to the competitive price and performance, as well as its simplified cabling structure. Several cable and interconnect solutions are available for 10GbE, the choice of which depends on the maximum interconnect distance, power budget and heat consumption, signal latency, network reliability, component adaptability to future requirements, cost. Here cost includes more than what we call the equipment interface and cable cost, but more often the labor cost. Thus, choosing a 10GbE interconnect solution requires careful evaluation of each option against the specific applications. This text aims to introduce two main 10GbE interconnect solutions: fiber optics and copper. Fiber optic cables include single-mode fiber (SMF) and multi-mode fiber (MMF). MMF is larger in diameter than that of single-mode, thus portions of the light beam follow different paths as they bounce back and forth between the walls of the fiber, leading to the possible distorted signal when reach the other end of the cable. The amount of distortion increases with the length of the cable. The light beam follows a single path through thinner single-mode cable, so the amount of distortion is much lower. The typical 10GBASE port type that uses MMF is 10GBASE-SR which uses 850nm lasers. When used with OM3 MMF, 10GBASE-SR can support 300m-connection distances, and when with OM4 MMF, 400m link length is possible through 10GBASE-SR SFP+ transceiver. 10GBASE-LR (eg. E10GSFPLR), 10GBASE-ER and 10GBASE-ZR are all specified to work via SMF. SMF can carry signals up to 80km, so it is more often used in wide-area networks. But since SMF requires a more expensive laser light source than MMF does, SMF is replaced by MMF when the required connection distance is not so long. 10GBASE-CX4, SFP+ Direct Attach (DAC) and 10GBASE-T are all specified to operate through copper medium. Being the first 10GbE copper solution standardized by the IEEE as 802.3ak in 2002, 10GBase-CX4 uses four cables, each carrying 2.5gigabits of data. It is specified to work up to a distance of 15m. Although 10GBase-CX4 provides an extremely cost-effective method to connect equipment within that 15m-distance, its bulky weight and big size of the CX4 connector prohibited higher switch densities required for large scale deployment. Besides, large diameter cables are purchased in fixed lengths, causing problems in managing cable slack. What’s more, the space isn’t sufficient enough to handle these large cables. SFP+ Direct Attach Cable (DAC), or called 10GSFP+Cu, is a copper 10GBASE twin-axial cable, connected directly into an SFP+ housing. It comes in either an active or passive twin-axial cable assembly. This solution provides a low-cost and low energy-consuming interconnect with a flexible cabling length, typically 1 to 7m (passive versions) or up to 15m (active versions) in length. Below is the SFP+ to SFP+ passive copper cable assembly with 1m length, 487655-B21, a HP compatible 10GbE cabling product. 10GBASE-T, known as IEEE 802.3an-2006, utilizes twisted pair cables and RJ-45 connectors over distances up to 100m. Cat 6 and Cat 6a are recommended, with the former reaching the full length at 100m, and the latter at 55m. In a word, 10GBASE-T permits operations over 4-connector structured 4-pair twisted-pair copper cabling for all supported distances within 100m. Besides, 10GBASE-T cabling solution is backward-compatible with 1000BASE-T switch infrastructures, keeping costs down while offering an easy migration path from 1GbE to 10GbE. In summary, two main media options are available for 10GbE interconnect: copper and fiber optics, including 10GBASE-CX4, SFP+ DAC, 10GBASE-T, 10GBASE-SR, 10GBASE-LR, 10GBASE-ER, 10GBASE-ZR, and so on. Fiberstore offers all these 10GBASE SFP+ modules and cables for your 10GbE deployment, which are quality-assured and cost-effective, like E10GSFPLR and 487655-B21 mentioned above. For more information about 10GbE interconnect solutions, you can visit Fiberstore. Since Ethernet technology is born in 1970s, it has evolved continuously to meet the never-ceasing demands of even faster rates of data transmission, such as 10 Gigabit Ethernet (GbE). Along with this ongoing evolution, the cabling technologies that support the 10GbE applications have also advanced, so as to provide greater bandwidth to transmit data with reasonable cost and decreased complexity. Maybe you have few insights in this evolution. Don’t worry. This text mainly talks about the evolution of 10GbE cabling technologies, including fiber and copper cabling technologies. The Institute of Electrical and Electronics Engineers (IEEE) 802.3 working group has published several standards regarding 10GbE, including 802.3ae-2002 (fiber -SR, -LR, -ER), 802.3ak-2004 (CX4 copper twin-ax InfiniBand type cable), etc. Actually, the evolution of cabling technologies have walked in step with that of 10GbE standards, especially associated with the difference between IEEE802.3ae and IEEE802.3ak standards. Ratified in June 2002, the IEEE802.3ae standard outlined the following port types. 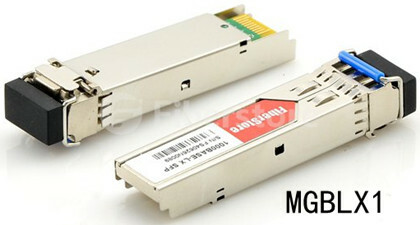 10GBASE-SR—It supports 10GbE transmission over standard multi-mode fiber (MMF) with distances of 33m on OM1 and 86m on OM2. Using 2000 MHz/km MMF (OM3), up to 300-m link lengths are possible. Using 4700 MHz/km MMF (OM4), up to 400 meter link lengths are possible. Like SFP-10G-SR-S (shown below), this Cisco 10GBASE-SR module listed in Fiberstore is able to support up to 300m using OM3 at the maximum data rate of 10.3125Gbps. 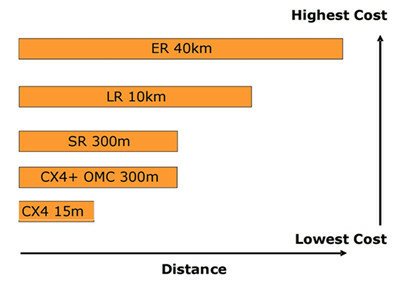 In addition, SR is the lowest-cost optics (850nm) of all defined 10GbE optics. 10GBASE-LR—This port type uses higher cost optics (1310nm) than SR and requires more complex alignment of the optics to support 10km link length over single-mode fiber (SMF). 10GBASE-ER—It’s a port type for SMF and uses the most expensive optics (1550nm) lasers, enabling a reach of 40km over engineered links and 30km over standard links. Approved in February 2004, this IEEE802.3ak standard only defined 10GBASE-CX4—the first 10GbE copper cabling standard. 10GBASE-CX4—It’s a low-cost 10GbE solution intended for copper cabling with short-distance connectivity. Its affordability and wide availability makes 10GBASE-CX4 ideal for wiring closet and data center connectivity. The CX4 standard transmits 10GbE over four channels using twin-axial cables which originated from Infiniband connectors and cable. The CX4 standard committee defined that the cables should be tighter in electrical specifications. Therefore, CX4 standard is not appropriate when longer length (>10 Infiniband cable is required. And It’s recommended to use only cables that are designed to meet IEEE 802.3ak specifications. Another aspect of the CX4 cable is the rigidity and thickness of the cable. The longer the length used, the thicker the cable is. CX4 cables must also be factory-terminated to meet defined specifications. After comparison between IEEE802.3ae and IEEE802.3ak standards, here goes a picture about the cabling cost and distance considerations. Besides IEEE802.3ae and IEEE802.3ak standards, there also exists IEEE802.3an standard. Proposed in November 2002, IEEE802.3an defined 10GBASE-T using unshielded twisted-pair (UTP) style cabling. The goal of this copper standard is to improve the performance and distance of copper cabling at a cost that is lower or similar to fiber. From the above introduction, the evolution of cabling technologies is associated with the evolution of 10GbE standards. As 10GbE deployment becomes a commonplace, it’s of great importance to make wise cabling strategies. Spurred by the demand for faster application speeds, cabling technologies evolved to support the 10GbE standards, thus to better accommodate bandwidth-intensive applications and traffic types. With 10GbE technology being pervasive, it’s necessary to understand the the different 10GbE standards and cabling technologies (mentioned above). Fiberstore supplies 10GbE application solutions, transceivers, copper and fiber cables all included, like AFBR-703SDZ-IN2, a 10GBASE-SR SFP+ transceiver. For more information about 10GbE system solutions, you can visit Fiberstore. Contaminated fiber optic cables can often lead to degraded network performance or even failure of the whole system. As such, to ensure that fiber optic cables can yield the best possible results of network performance, and it’s of great significance for network engineers to keep in mind how to handle fiber optic cables. Do you have any ideas? This text gives the guide to fiber optic cable handling rues. Before delving into how to handle fiber optic cables, introduction to their makeup elements is required. 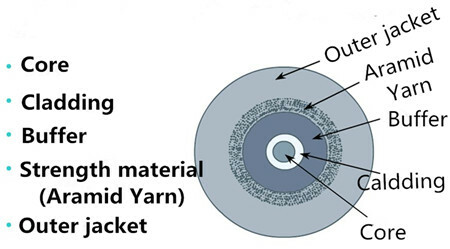 Fiber optic cable generally consists of fiver elements (figure shown above): the optic core, optic cladding, a buffer material, a strength material and the outer jacket. Commonly made from doped silica (glass), the optic core is the light-carrying element at the center of the cable. Surrounding the core is the optic cladding, whose combination with the core makes the principle of total internal reflection possible. Surrounding the cladding is a buffer material used to help shield the core and cladding from damage. A strength material surrounds the buffer, preventing stretch problems when the fiber cable is being pulled. The outer jacket is added to protect against abrasion, solvents, and other contaminants. The outer jacket on fiber optic patch cord is often color-coded to indicate the fiber types being used. 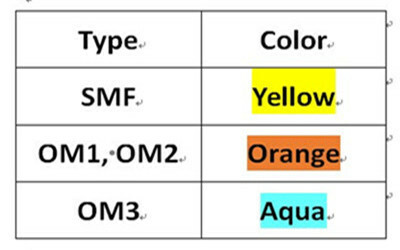 For instance, multi-mode fiber (MMF) is usually in orange to distinguish from the color yellow for single-mode fiber (SMF) through which fiber optic transceivers realize relatively long distance, such as MGBLX1. This Cisco 1000BASE-LX SFP transceiver is able to achieve 10km link length over SMF. Despite its outer protection mentioned above, fiber optic cable is still prone to damage. In such as case, a series of fiber cable handing rules are made to ensure that a cable is handled properly, so as to maintain the optimized performance, minimum insertion loss and safe working environments. Rule 1: The exposed fiber end from coming in contact with all surfaces should be protected. If you contact the fiber with hard surfaces, then the end of it shall be scratched or chipped, causing the degraded performance. 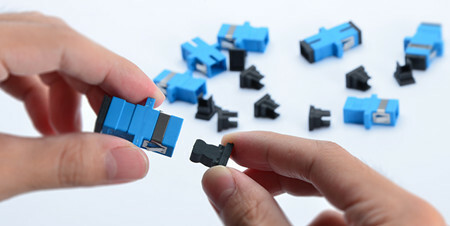 Rule 2: It’s highly recommenced to lean the connector (plug) end each time it is inserted into an adapter, since since a dirty connector will contaminate an adapter. Rule 3: If a fiber needs to be pulled, use the connector strain relief. Directly pulling on the fiber may result in the glass breaking. Rule 4: It’s ill-advised to use your hands to clean a fiber work area. If you use your hands to wipe clean a work area, a piece of glass may get lodged into your hands. Considering the size of the glass, this glass may not be visible to the naked eye, bringing about eye damage. Rule 5: If possible, always keep a protective cap on unplugged fiber connectors, because covering the adapters and connectors will help to avoid contamination and collection of residue. Besides, store unused protective caps in a resealable container in order to prevent the possibility of the transfer of dust to the fiber. Locate the containers near the connectors for easy access. Rule 6: It’s suggestible to use fiber-cleaning materials only once. If optic grade wipes are used to clean the fiber end, they should be discarded immediately after the fiber surface has been wiped to avoid contamination. Rule 7: The minimum bend radius of the fiber optic cable must be maintained. Surpassing the bend radius may cause the glass to fracture inside the fiber optic cable. Equally, to cause a twist of the cable is also not proposed. Rule 8: Never look into a fiber while the system lasers are on. Eye damage may occur if you stare directly at a fiber end which is working. Always make sure that the fiber optic cables are disconnected from the laser source, prior to inspection. After discussion, these handling rules may help you to deal with fiber optic cables and improve your network performance. Proper handling procedures for fiber optic cables are needed to eliminate the possibility of being contaminated or damaged, and provide a clean environment for the network system. Fiberstore supplies many different types of fiber optic cables with high quality for various applications, like MTP cable. You can visit Fiberstore for more information about fiber optic cables. 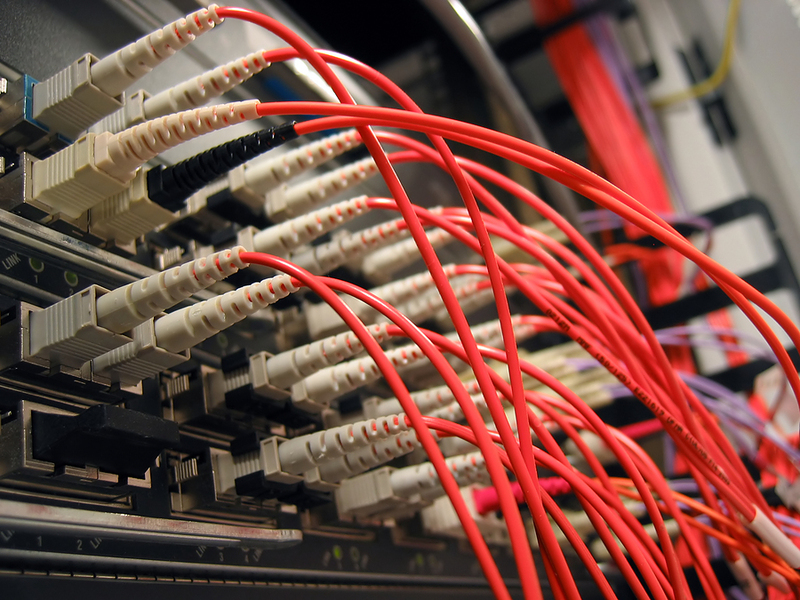 To meet the needs of Internet users, the business users in particular, who require faster speeds, greater scalability, and higher levels of network performance and reliability, data centers have experienced infrastructure transformation, from 10 Gbps to 40 Gbps and then to 100 Gbps, or even higher, never-ceasing. Actually, during this bandwidth migration, 40G provides an efficient use of hardware and a more logical upgrade path to 100G. And in establishing 40G links, fiber optic cabling, (eg OM3 and OM4) has become an integral part of the overall system design. The Institute of Electrical and Electronics Engineers (IEEE) 802.3ba 40/100G Ethernet Standard was ratified in June 2010 to support the fast-growing demands for bandwidth in data centers. The standard provides specific guidance for 40G/100G transmission with multi-mode fibers (MMFs) and single-mode fibers (SMFs). OM3 and OM4 are the only approved multi-mode fibers included in this standard. The IEEE 802.3ba only specified OM3 for a maximum reach of 100 m in its original draft. Later, efforts have been made to win the approval to include OM4 in the standard. As a matter of fact, OM4 can achieve the greater reach of 150 m compared with OM3. In 40 GbE transmission which uses MMFs, an optic module interface is used for the simultaneous data transmission and data reception. Like JNP-QSFP-40G-LX4, this Juniper Networks proprietary 40G-LX4 transceiver listed on FS.COM realizes 100 m transmission on OM3, and 150 m transmission on OM4. Besides, JNP-QSFP-40G-LX4 can also run over SMF for 2 km link lengths. When evaluating the performance of the OM3 and OM4 cabling infrastructure for 40GbE transmissions, three aspects should be taken into consideration: bandwidth, channel connector insertion loss (CIL) and skew. In the standard, the bandwidth is ensured by meeting the effective modal bandwidth (EMB) specification. The EMB measurement techniques utilized nowadays are effective modal bandwidth calculate (EMBc) which combines the properties of both the source and fiber. The EMBc process predicts source-fiber performance by integrating the fundamental properties of light sources with the MMF’s modal structure which has been measured using a standardized differential modal delay (DMD) measurement. Within 40G links using OM3 and OM4 fibers measured by the EMBc technique, the optical infrastructure shall meet the performance criteria set forth by IEEE for bandwidth. CIL is a critical performance parameter in current data center cabling deployments. It refers to the total insertion losses that happen when the signal moves along a fiber optic cable. Within a system channel, CIL impacts the ability to operate over the maximum distance at a given data rate. With total connector loss increasing, the maximum distance at that given data rate decreases. The 40/100G standard specifies the OM3 to a 100m distance with a maximum channel loss of 1.9dB, while OM4 is specified to a 150m distance with a maximum channel loss of 1.5dB. Skew is classified as the difference between the arrival times of simultaneously launched light signals traveling through parallel cable lanes. When evaluating OM3 and OM4 performance for 40applications, selecting one that meets the 0.75ns skew requirement can ensure the performance. 40G is deployed using eight of the twelve fibers in a MPO connector. Four of these eight fibers are used to transmit while the other four to receive. Each Tx/Rx is operating at 10G. The 40GBASE-SR4 (eg. 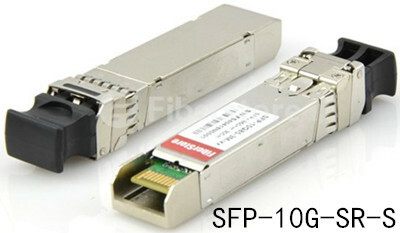 QFX-QSFP-40G-SR4) interface is as follows: 4 x 10G on four fibers per direction. OM3 and OM4 for 40G connectivity provide a significant value proposition when compared to SMF, as MMF utilizes low cost 850nm transceivers for serial and parallel transmissions. OM3 and OM4 ensure today’s bandwidth needs. To continue to accommodate the bandwidth needs, OM3 and OM4 are the ideal solution for 40G links in the data center. FS.COM offers broad selections of OM3 and OM4 fibers of high quality, as well as fiber optic transceivers working over OM3 and OM4, such as JNP-QSFP-40G-LX4 and QFX-QSFP-40G-SR4 mentioned above. You can visit FS.COM for more information about OM3 and OM4, MMF. With the ever increasing need for even greater bandwidth in data centers, multi-mode fiber cables (MMFs) have proven to be a practical optical solution to support such fast-changing and fast-growing bandwidth demand. MTP/MPO fiber cabling, ideal for quick and reliable MMF connectivity, provide an effective way for 40GbE network solutions, ensuring a high-performance and high-speed network. This blog includes basic information about MPO/MTP fiber cabling solutions. The term MTP is a registered trademark of US Conec used to describe their connector. The US Conec MTP product is fully compliant with the MPO standards. As such, the MTP connector is a MPO connector. MTP/MPO fiber cables, as an important part of the MPO/MTP cabling system, are designed to go on reliable and quick operations for the multi-fiber connection system in data centers. Each MTP fiber cable contains 12 fibers or 6 duplex channels in a connector, thus requiring less space. Besides, MTP/MPO fibers are manufactured with outstanding optical and mechanical properties, which makes them able to offer more improved scalability. What’s more, it is easy to have cable management and maintenance on them. Generally speaking, MTP/MPO fiber cables can save a lot of money and space to some extent. When it come to types, MTP/MPO fiber cables fall on MTP/MPO trunk cables and MTP/MPO harness cables. MTP/MPO trunk cables, available in 12-144 counts, are intended for high-density application. By using MTP/MPO trunk cables, the installation of a complete fiber optic backbone is accessible without any field termination. MTP/MPO harness cables, also called MTP/MPO breakout cables or MTP/MPO fanout cables, available in 8-144 counts, are used for breaking out the MTP into several connections. They provide connection to equipment or panels that are terminated with other standard connectors. As terminated with MTP/MPO connectors on one end and standard LC/FC/SC/ST/MTRJ connectors (generally MTP to LC) on the other end, these cable assemblies can meet a variety of fiber cabling requirements. The Institute of Electrical and Electronics Engineers (IEEE) 802.3ba 40 Ethernet Standard was ratified in June 2010. The IEEE 802.3ba standard specifies MPO connectors for standard-length MMF connectivity. MMF employs parallel optics using MPO interconnects for 40GbE transmission. More specifically, 40G is implemented using eight of the twelve fibers in a MPO connector. Four of these eight fibers are used to transmit while the other four are used to receive. Each Tx/Rx pair is operating at 10G. Fiberstore MPO-based fiber cabling solutions provide a fast , simple and economical way for 40G applications. Certainly, Fiberstore 40G fiber cabling solutions are not limited to MPO/MTP fiber cables. Copper cables are also recommended. Take CAB-Q-Q-1M for example, Arista CAB-Q-Q-1M is the QSFP+ to QSFP+ passive copper cable assembly for 40G links. Or one of other Fiberstore 40G fiber cabling products: JG329A, Fiberstore compatible HP JG329A runs over passive breakout copper cable for 40-gigabit links. 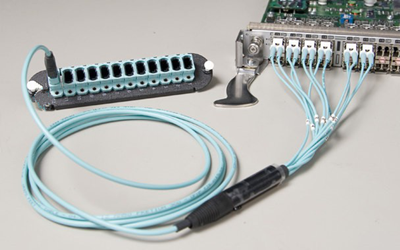 The MTP jumpers serve to create the connection between the device ports and the structured cabling via the connector panel. High-density MTP/MPO fiber cabling plays a significant part in cabling structure, suitable for telecommunications. Fiberstore provides both single-mode and multi-mode MPO and MTP fiber cables, as well as other MTP/MPO cable assemblies, including trunk cables, harness cables and jumpers. Customized products are also available upon your request. For more information about MPO/MTP fiber cables as well as 40G fiber cabling products (like Arista CAB-Q-Q-1M and HP JG329A mentioned above), please visit Fiberstore. Driven by growing bandwidth and network performance demand, data center network infrastructure is witnessing a transformation. As technology evolves, standards are completed to define data rates such as 40 Gigabit Ethernet (GbE) to meet such demands of high networking speed and performance. 40GbE addresses physical layer specifications for communication across backplanes, copper cabling, single-mode fiber(SMF), and multi-mode fiber (MMF). 1G and 10G data rates are not adequate to meet the future needs of high-bandwidth applications. The requirement for higher data rates is being driven by many factors. Switching and routing, virtualization, convergence and high-performance computing environments are examples of where these higher network speeds will be required within the data center environment. Additionally, Internet exchanges and service provider peering points and high-bandwidth applications, such as video-on-demand driving the need for a migration from 10G to 40G interfaces. 40GbE standards already exist for SMF, MPO based MMF, as well as copper cables. Listed below are three physical layer solutions for 40GbE. Due to its long reach and superior transmission performance, SMF is specified for carrying 40Gbps data up to a distance as long as 10km (40GBASE-LR4). The physical layer electronics and optics consist of four channels, each carrying 10Gbps data with different wavelengths. When there is no need to consider budget or the link distances are long, SMF is the preferred option for 40GbE in data center networks. For short reach channels up to a length of 7m, 40GBASE-CR4 standard specifies use of twinax copper cable assembly. One typical application of this kind of copper cable is in 40G QSFP+ direct attach cable (DAC). For instance, Fiberstore compatible Brocade 40G-QSFP-C-0101 is the QSFP+ to QSFP+ passive copper cable assembly for very short distances. for multi-mode fiber and copper today. 40GbE supports high-speed switching, routing, and application functions in data centers. It provides optimized performance in meeting data center requirements. As a professional fiber optic products supplier and manufacturer, Fiberstore offers various 40GbE products, like 40G transceivers, and 40G cabling available both in fiber and copper. You can visit Fiberstore for more information about 40GbE solutions.